Chesterfield is just south of Richmond and has a land mass of 437 square miles. With 343,000 residents, it is the largest county in Central Virginia in terms of population (and fourth largest in Virginia). 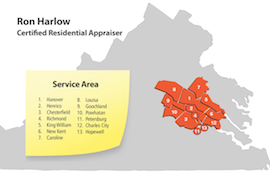 This area is made up of many markets; the highest home values are in the northwestern part of the county. Interesting trivia: The Manchester Turnpike (now Route 60), completed in 1807, was the first graveled roadway of any length in Virginia.